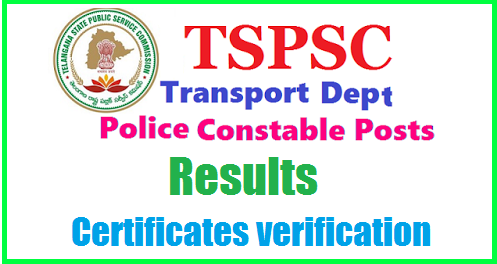 TSPSC Transport Constables Results,Merit List 2016- Certificates Verification Schedule.TSPSC Transport Police Constable Posts Recruitment 2016 in Transport Department,TSPSC Police Constable Posts 2016/, Telangana State Public Service Commission (TSPSC) has released a recruitment notification for 137 Police Constable Posts Posts in Department of Transport. TSPSC invited Online applications from qualified candidates through the proforma Application to be made available on Commission’s webportal (www.tspsc.gov.in) to the post of Constable Posts in Department of Transport in the State of Telangana. Online Application Form, Eligibility Criteria, Post details, How to Apply, Registration Fee, Last Date, Exam Date, Hall Tickets and Results are provided here. Age as on: 01/07/2016 Minimum age is 18 years and Maximum age is 44 years. The age is reckoned as on 01/07/2016 (Rule- 12(1)(a)(v) of State and Subordinate Service Rules). *As per G.O. Ms. No. 329 GA(Ser.A) Dept., Dt. 27/07/2015 the upper age limit is raised up to 10 years i.e., from 34 years to 44 years. 1. No person shall be eligible if he/she is less than 18 years of age. 2. No person shall be eligible if he/she has crossed 58 years of age (Superannuation age). Applicants must possess the Intermediate qualifications from a recognized institution. i) Must have passed Intermediate examination or any other examination recognized as its equivalent by the Board of Intermediate Education. ii) Must possess a Motor Driving License to drive Light Motor Vehicle as on the Date of Notification. i) For Men: The Minimum height must not be less than 165 Cms. in height and must not be less than 86.3 Cms. round the chest on full inspiration with a minimum expansion of 5.00 Cms. a) For Men (SC/ST and Aboriginal Tribes): The minimum height must not be less than 160 Cms. and must not be less than 83.80 Cms. round the chest on full inspiration with a minimum expansion of 5.00 Cms. ii) For Women: The height shall not be less than 157.5 Cms. and must not be less than 82.30 Cms. round the chest on full inspiration with a minimum of expansion 5.00 Cms. (c) Each eye must have a full field of vision. (d) Colour Blindness, Squint or any morbid conditions of the eyes or lids of either eye, knock kness, pigeon chest, flat foot, varicose veins, hammer toes, fractured limbs and decayed teeth shall be deemed to be a disqualification. Note:-The applicants should satisfy a competent Medical Board as to their fitness, Physical Requirements, Vision etc., as provided for in the Rules at the appropriate stage of the recruitment process. Each applicant must pay Rs. 200/- (RUPEES TWO HUNDRED ONLY) towards Online Application Processing Fee and the applicants have also to pay RS.80/- (RUPEES EIGHTY ONLY) towards Examination Fee. However, the following category of candidates are exempted from payment of Examination fee. b) Unemployed applicants in the age group of 21-34 years have to submit declaration at an appropriate time to the Commission that they are unemployed. The Fee mentioned at Para-I(6)(a) is to be paid online through SBI ePay duly following online instructions once the application form details are submitted by filling TSPSC ID, date of birth and other particulars. The fee once remitted, shall not be refunded or adjusted under any circumstances. TRANSPORT CONSTABLES IN TRANSPORT DEPARTMENT:: NOTIFICATION NO. 05/2016. List of Hall Ticket Numbers of the Candidates Selected Provisionally Page 1 of 2 It is hereby notified on the basis of the results of the written examination held on 31/07/2016 and verification of certificates held on 27/10/2016, 28/10/2016, 17/01/2016, 21/01/2017 & 14/03/2017 at TSPSC Office, Hyderabad to the post of TRANSPORT CONSTABLE IN TRANSPORT DEPARTMENT. The following register numbers have been provisionally selected for appointment to the post of TRANSPORT CONSTABLE IN TRANSPORT DEPARTMENT vide Commission’s Notification No.05/2016 subject to the following conditions.